SHORT FILM: BEST PASTA-MAKING DAY EVER! The film is password protected. If you would like to see Saint Joseph Pasta-Making Day, please contact kimsmith.designs1@gmail.com. When late winter snow melts while March winds blow blustery, Gloucester’s Sicilian American community begins to prepare for the annual novena and feast celebration in honor of Saint Joseph, the father of Jesus, husband of Mary, and many consider, the patron saint of Sicily. The fishing port of Gloucester has a long history of welcoming immigrants. Around the turn of the previous century four million Italians immigrated to the United States. Little Italys sprang up all over the country and within these communities today, Sicilian traditions continue to be celebrated. True heroes of the festa are the parents, nonnas, nonnos, aunts, and uncles who each year open their homes and hearts to the community. They grew up with a deep sense of security provided by la famiglia and are devoted to keeping these traditions alive for the children of the next generation. 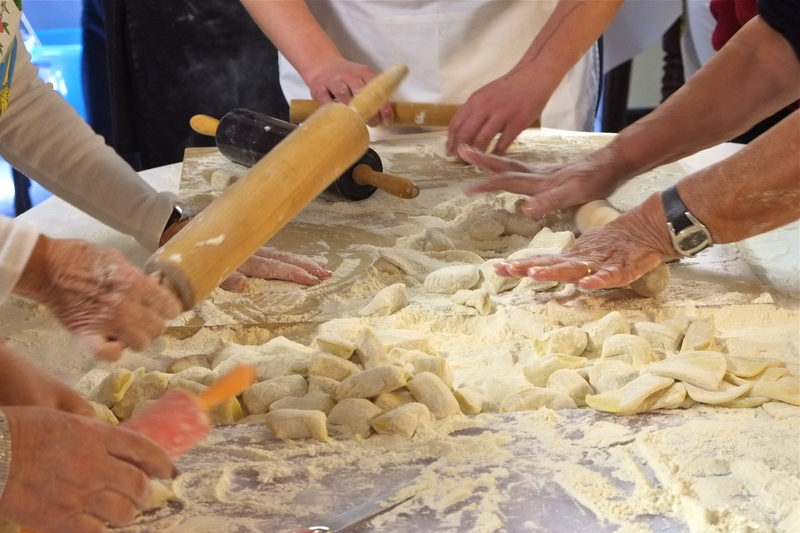 Each year at the home of Nina and Franco Groppo a troupe of family and friends gather to make pasta for Saint Joseph’s feast. The pasta complements a traditional sauce made of fava beans and cauliflower. Legend has it that the during the great famine of the Middle Ages, prayers to Saint Joseph—and the lucky fava bean—saved the Sicilians from starvation. This entry was posted in Feast of Saint Joseph, Feast of San Giuseppe, Gloucester, Gloucester' Feast of Saint Joseph, Gloucester's Feast of Saint Joseph Film Project, Kim Smith, Saint Joseph Day Food, Saint Joseph traditions, Sicilian American traditions and tagged Best Pasta Making Day, Gloucester tradtitions, Groppo Family Feast of Saint joseph, Saint Joseph pasta, Saint Joseph sauce, Sicilian American traditions on March 22, 2017 by Kim Smith.